Abstract: Background: A prospective study of patients with acute coronary syndrome (ACS), who met the inclusion criteria, was carried out. 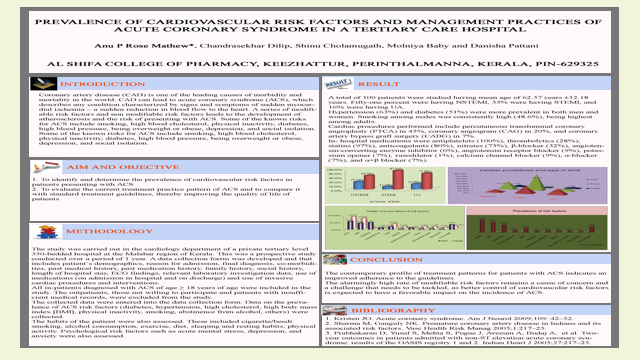 It was conducted in the cardiology department of tertiary care referral hospital in Kerala. Objectives: To determine the prevalence of cardiovascular risk factors in patients presenting with ACS and to evaluate the current treatment practice pattern of ACS and to compare it with standard treatment guidelines. Methods: Data of patients who met the inclusion criteria were collected in specially designed data collection form.Patients with ACS included those with ST-elevation myocardial infarction (STEMI), non-ST elevation myocardial infarction (NSTEMI), and unstable angina (UA). Descriptive statistics were performed. All statistical analysis was done using Statistical Package for Social Sciences (SPSS) software version 16.0. Results: A total of 100 patients were studied having mean age of 62.57 years±12.18 years. Fifty-one percent were having NSTEMI, 33% were having STEMI, and 16% were having UA. Hypertension (63%) and diabetes (51%) were more prevalent in both men and women. Smoking among males was consistently high (48.6%), being highest among adults. Cardiac procedures performed include percutaneous transluminal coronary angioplasty (PTCA) in 45%, coronary angiogram (CAG) in 20%, and coronary artery bypass graft surgery (CABG) in 7%. In-hospital medications were antiplatelets (100%), thrombolytics (28%), statins (97%), santicoagulants (80%), nitrates (73%), β-blocker (32%), angiotensin-converting enzyme inhibitor (6%), angiotensin receptor blocker (9%), potassium opener (7%), vasodilator (1%), calcium channel blocker (9%), α-blocker (7%), and α+β blocker (7%). Conclusions: The contemporary profile of treatment patterns for patients with ACS indicates an improved adherence to the guidelines. The alarmingly high rate of modifiable risk factors remains a cause of concern and a challenge that needs to be tackled, as better control of cardiovascular risk factors is expected to have a favorableimpact on the incidence of ACS.